Centre Fraser Lyle has signed a new two-year contract with Glasgow Warriors, while winger Rory Hughes has agreed a one-year deal. Twenty-six-year-old Lyle signed from Stirling County in November to earn his first professional contract and has made four top-team appearances to date. Hughes, 22, made his Warriors debut against Connacht in February 2014 and was part of the Glasgow squad that won the Melrose Sevens in 2014 and 2015. He has made seven Glasgow appearances. This season, though, Hughes has been playing for Stirling County in the Scottish Premiership. He said: "I've really enjoyed my first year as a professional and I'm happy to be staying at the club. "I want to continue to make a contribution and get as much game time as possible next season." Lyle made his Warriors debut against Zebre in Parma in February and scored a try in the 54-10 win. He was called up to the Scotland Sevens squad in March 2015 and won his first cap at the Hong Kong Sevens. Lyle marked his debut with tries against New Zealand and Wales that weekend. He said: "It's such a great environment at Scotstoun and I've really enjoyed working with the coaches and developing my game. "I played some games during the Six Nations when our Scotland players were away and I enjoyed being able to contribute to the success of the team." 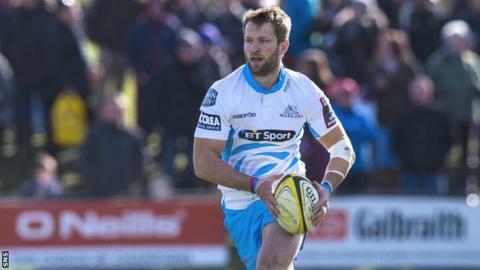 Warriors head coach Gregor Townsend described the dual signing as "great news". "Fraser came in earlier this season and worked very hard to earn a short-term deal, so we're delighted he's extended his contract with us," he said. "He's had a really good season, impressing for us during the international window and then for Scotland Sevens. "Rory has come through our academy system and has made a lot of improvements in his game since signing his first professional contract at the start of this season. "He is maturing as a person and has a very professional approach to getting the most out of his rugby career. "He was a key member of our squad which won back-to-back Melrose Sevens titles and has been playing well for Stirling County in the BT Premiership this season. "Both players have worked extremely hard to earn new contracts and are set to play bigger roles at the club next season."